Shortly after graduating from the University of Alberta with a law degree, Bruce Macdonald moved to Windsor in 1927 and joined the a law firm of Norman A. McLarty and Gordon L. Fraser. Appointed Windsor’s first full time City Solicitor in September 1930, Macdonald was active in the plan to fund and refund the debts of the Amalgamated Municipalities of East Windsor, Walkerville, Windsor and Sandwich. He resigned in 1937 over a dispute regarding the ownership of his legal fees, and returned to private practice with McLarty and Fraser until the outbreak of the Second World War. 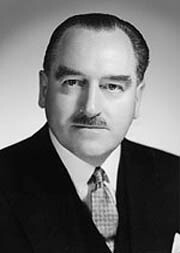 After returning to Windsor from active service overseas in 1946, Macdonald was appointed King’s Council and joined the newly created law firm of Robert Wilson, Gordon Thomson and Bruce J. S. Macdonald. 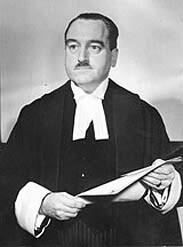 Appointed Crown Attorney for Essex County in April 1951, Macdonald’s primary challenge was to restore order to the troubled Windsor Police Department. 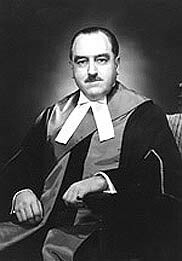 He held that position until October 1961 when he became the Judge of County and District Courts of Ontario with residence in Windsor. 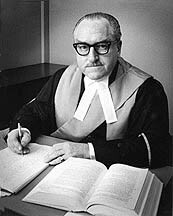 After retiring in December 1977, Macdonald presided as a Small Claims Court Judge until his death in 1986. His Honour Bruce J. S. Macdonald, OBE, April 1964. 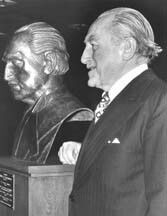 Photograph of Bruce Macdonald with his bust, unveiled by the Essex Law Society, 1977.